And there’s some Americans with guns which is never a good thing. I love how incredibly British it is. How very London it is. Every page is just so full of London, London places, London culture, London history. 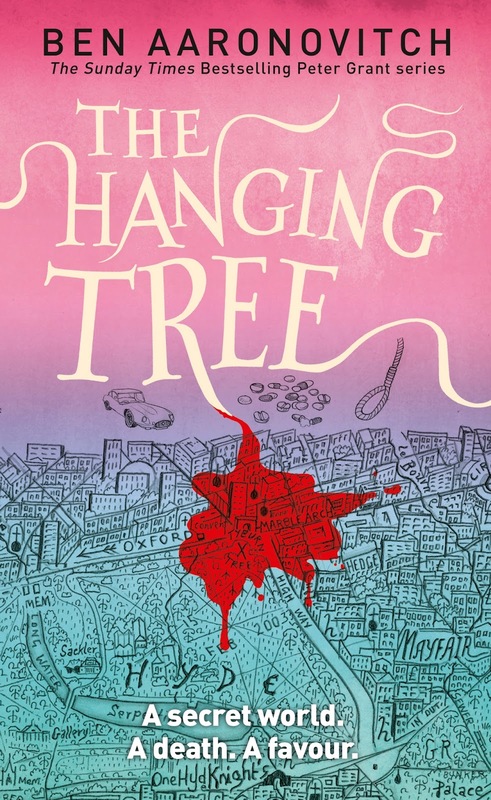 I don’t really know a lot about Ben Aaronovitch but he must be a Londoner and he both loves his city but also sees it very clearly – knows it for what it is. The constant, fun wry comments about the city, the places, the rivers, how things have changed, how they’ve adapted are so much fun and add such an incredible richness to the series. Because we’re not just adding a rich supernatural world and culture to the city, but the city itself – the actual, real, London - is also explored in so much depth and history and commentary and it’s so much fun. And, honestly, it shouldn’t be because there’s such a lot there – but Peter’s irreverent tone, his completely sarcastic, very British and wry take down of it all is excellent. The way he loves his home but is fully aware of all of the problems of it as well, all of the nasty realities. That acknowledgement of London as it is also includes all of its racial diversity. Mama Thames and all of her daughters are Black. Peter is Black, his mother from Sierra Leone. We have Guleed who is Middle Eastern, Muslim and wears a Hijab and plays a major role throughout the book become a de-facto Folly member (I really hope she joins up because she’s an excellent partner for Peter, her wry cynicism touching nicely with his occasional naivety). Please more of this! On top of this there’s a real acknowledgment of how class, wealth and race affect people – how people are treated, what advantages they have and especially how hat relates to policing. There’s an excellent moment where one of the characters continually assumes they know so much about Peter – and ye gods they’re all stereotypes everyone has heard so many times before and we know so many fools think this – based on his race and class and it’s just so ridiculously wrong and far from Peter’s reality and his family. All of this insight also comes to Peter and policing – there’s a lot of knowledge of police procedure, some wry acknowledgement of the flaws and issues with the police (both past and present). It’s real, it’s topical, it’s funny, it’s informative and so very very snarky and very real. Lots of shoe leather. Lots of eliminating, pursuing leads, ticking boxes, and paperwork. So excellently snarky. Honestly I love it. I also really like the introduction of Lady Helena and the idea of magical practitioners outside of the Folly which came with some good commentary on how much the Folly was such a boy’s club and the sexism that came with it. Through that we have the magical world with the supernatural permeating everything with some awesome world building, more snark and lots of points of nuance. While I’m not particularly enjoying the Faceless Man and Leslie. I mean they were interesting but they don’t really hold. I can’t believe I’m saying this but I think I’d actually prefer lots of mystical crime of the week (hey, Peter’s a policeman it’d make sense) with this background organisational development rather than continually chasing the Facelessman and his agenda. It’s not that it’s not a great story – it is – but get out of my way I want to see this even broader metaplot that is coming. This hugely broad metaplot that is the backdrop behind the Faceless man story and everything else around this book and series. I continue to love this story – its size, its depth, the humour, the utter realness of it – and the power that brings that realness and the supernatural together to create something that is immensely fun and quintessentially British.